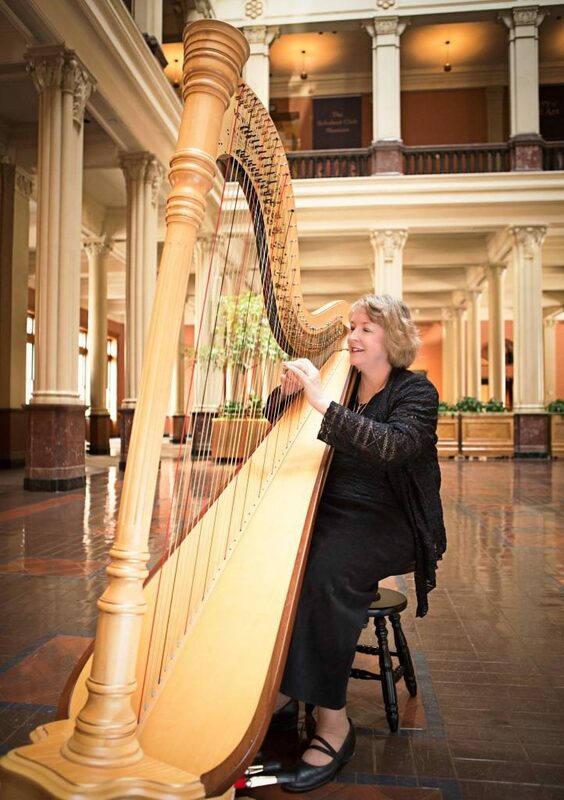 Serena would be happy to grace your event with elegant harp music. She can provide a Concert, Soiree, Musicale or music for any occasion. Her versatility is displayed though Classical, Pop, Country, Standards, Folk, Religious, Holiday or New Age musical selections. Besides solo harp, Serena teams up with her favorite professional singer or duos/trios with other professional musicians on harp, piano, flute, saxophone or clarinet. 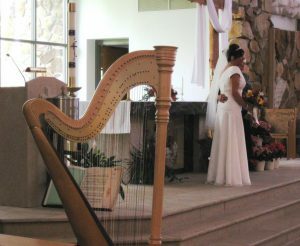 Harp music is perfect for Wedding Ceremonies, Receptions or Rehearsal Dinners, Anniversary Parties, Bridal and Baby Showers, Corporate Events, Christmas and Holiday Events, Grand Openings and Open Houses, Retirements, Funerals and Memorial Services. Serena will to travel to where ever your event is being held! 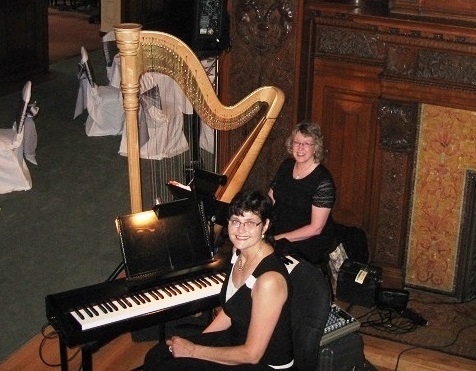 As the ‘Royal Event Musicians‘ Serena O’Meara and Sharon Planer, harp and piano duo love to perform elegant music for Weddings and Celebrations! They also have an enchanting repertoire for Victorian and Downton Abbey themed events and English tea parties. Would you like your Wedding Ceremony and Reception music to be truly unique? The rich resonance of the piano performed with the glistening strings of the concert harp will make your wedding day music memorable! From Mozart to Daft Punk, we will create the atmosphere that reflects your wishes. Are you hosting a Tea Party? Hire Sharon and Serena and your event will be the most talked about social occasion of the year! You and your guests will be awestruck by the glistening concert harp and the exquisite harp and piano music! They will perform music that was actually performed for Queen Victoria! The music was arranged for harp and piano by her harpist, John Thomas. This authentic harp and piano duo sheet music has been handed down from teacher to student over some generations and is now in the possession of Serena O’Meara. Serena and Sharon would love to perform it for you! Invite your guests, put on your fancy hat and gloves, and let Serena and Sharon’s music bring you back to a nostalgic era of friends, teacups and socializing. Will my guests be able to hear the Harp? I have various sizes of harps. The larger the soundboard of a harp, the louder the sound it produces. I also have a small amplifier to use; I can plug my microphone into a “House System” or Band/DJ system; or you can provide a remote microphone for your system. When I play as a flute/harp or piano/harp duo, we bring a larger amplification system that helps to equalize our sound. My Venus Pedal harps or Triplett Celtic harps do produce mellow sounds. a) There is a BACK-UP PLAN for where the event is moving to in case of inclement weather. Harps do not move quickly! The decision to move indoors need to be made in a reasonable time to when the harp needs to begin playing. Should it begin precipitating during the time I’m am playing, I will need to cover the harp and move it to safety immediately. b) I will be provided with a 6×6, flat, dry, cigarette smoke-free and bubble blowing-free space to set-up my harp. There needs to be flexibility as to where the harp will set-up. The harp should set-up with the breeze so its sound travels to the guests. Sometimes that means that the Bridal Party can not hear the Processional start. Your Wedding Coordinator will communicate with the Party. Both cigarette smoke and bubbles create havoc on harps! I do bring my own bug spray! c) The outdoor temperature, in area where I am to sit, needs to be above 65 degrees F. That limits the outdoor weddings in May and September. I have a tent cover to use and can put sides on it to protect the harp from breezes, the sun, pine pitch and acorns. I can not allow guests to stand under my cover for insurance reasons. d) Humidity needs to be steady – for example in a Conservatory or tent. My harps are made of wood, which reacts to changes in humidity – like a “front” coming through. When the air is very heavy with humidity the strings on my harp will not hold their pitch very long! 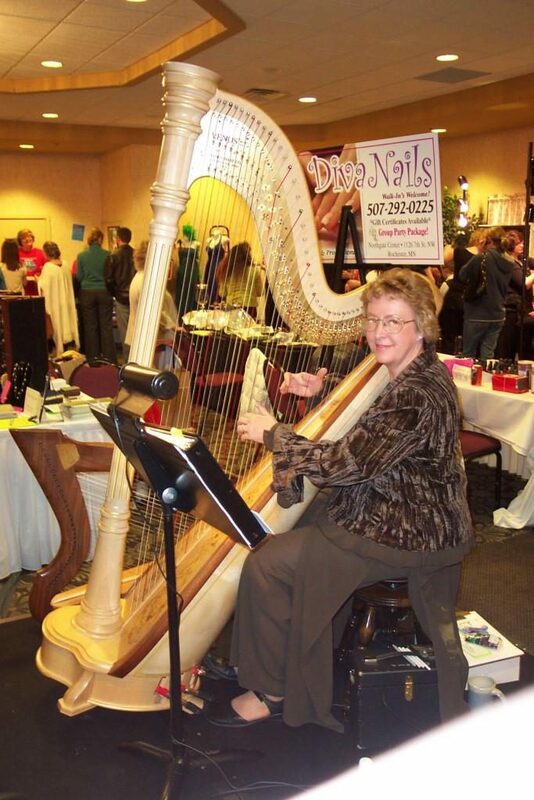 Likewise, sitting next to a fireplace or tent heaters (very dry air) is not good for the wood of a harp. Besides the fluctuation in pitch, extreme humidity can affect the quality of sound from the instrument. e) The strings of a harp will naturally vibrate with the wind blowing through them! Some people like that sound of the harp “talking”. I can do what I can to stop that sound. While performing, there isn’t much I can do to stop the extra sound. High winds are considered to be inclement weather – meaning – I will not perform outdoors! f) In case of rain, either my car must be parked on the same plane/near of where I am performing or there is assistance to help me move my equipment and tent cover. I don’t let other people handle my harp and I will not take my harp down a flight of stairs, away from my car or a building. Will you accept special music requests? Yes, up to 28 days before the event – assuming the music is available in print and playable on the harp (Pedal or Lever) being used at the event. I do reserve the right to refuse to perform music that I deem is not playable!!! I will purchase and learn up to 3 new selections per wedding, after that I need to be provided with the music 28 days before the wedding and paid $10 per selection to learn it. Are you insured? 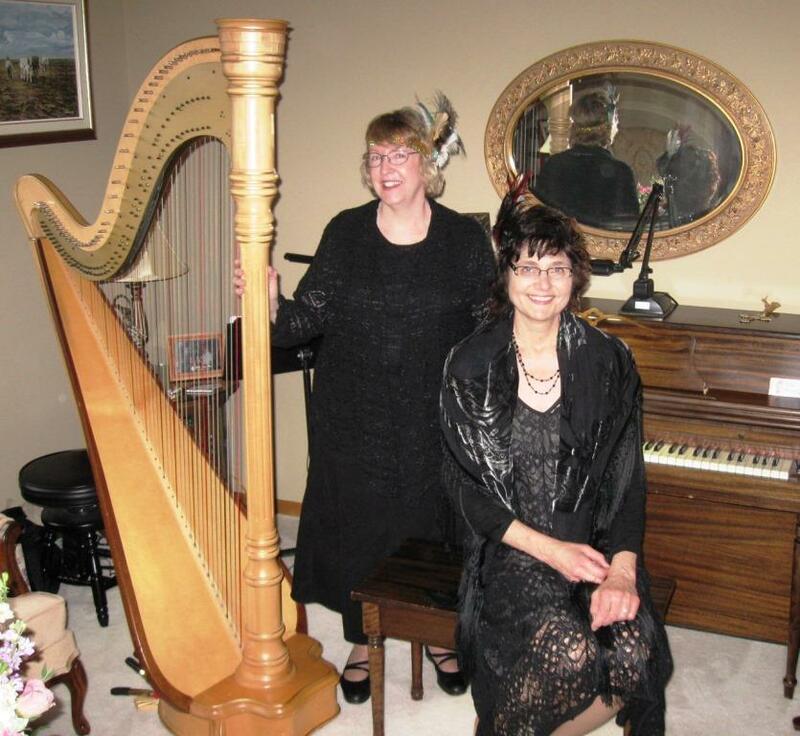 Yes, my harps are insured as musical instruments, plus I have small business insurance. Do you attend rehearsals? Yes, when I’m available and being paid to be present. I am good at watching for my cues, however sometimes the bridal couple wants everyone present. When the rehearsal is the same day and place as the wedding and it’s convenient for me to arrive early, then I do not need to be paid. Will you accompany other singers/musicians? Yes, I will rehearse once at my house and the day of the wedding. I have wonderful musicians that I love to work with – Diane Martinson (singer), Christine Sahs (singer), Terry Hoepner (singer), Mark Yannie (flute, clarinet and saxophone), Sharon Planer (pianist), and Bethany Shuda (harpist). We love creating duos/trios for events. 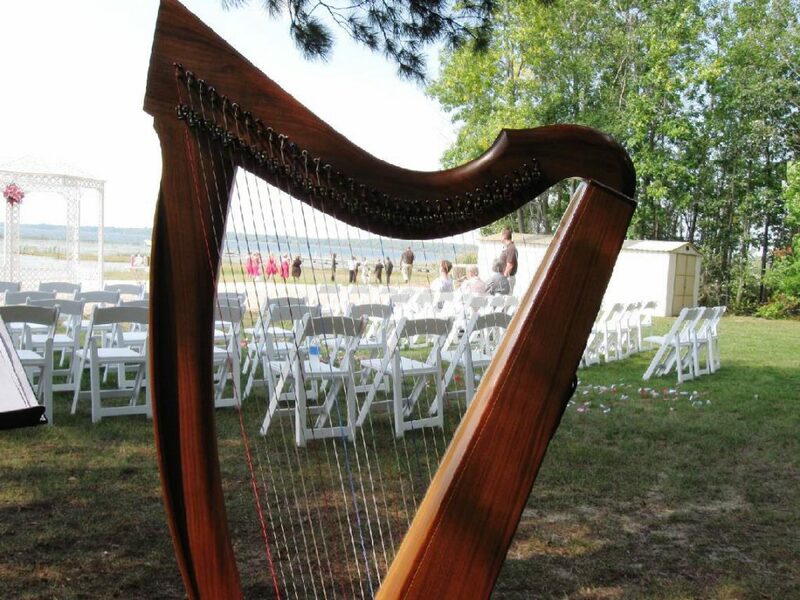 Why have a harp at my Wedding or Reception? 1) The vibration of the strings excites the air – surrounding the listeners with a warm, soft sound; 2) The sounds weaves the tapestry reflecting your love; 3) The graceful sight and romantic sound of a harp celebrates your love; 4) It surprises your guests!